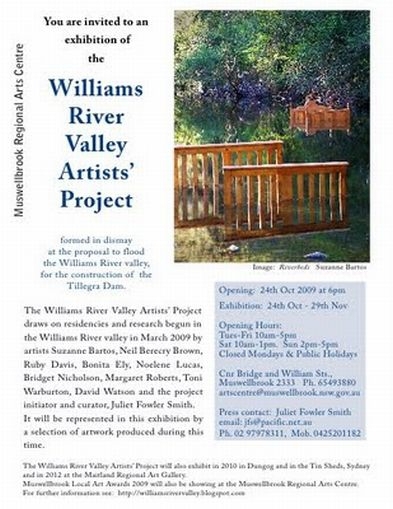 about the media Registration of a project af an artists group formed in dismay at the proposal to flood the Williams River Valley for the Tillegra Dam. about the project Up near Barrington Tops (200km north of Sydney) lies the glorious Williams River valley – 22 kilometres of pristine winding river flanked by rich dairy pasture, primeval forest and national park. However, the precious ecosystems of this last healthy river in the Hunter will be destroyed if Hunter Water's proposed $480 million Tillegra Dam proceeds. A dam the size of Sydney Harbour would flood the valley; Hunter residents would pay for it in their water bills; all of us would lose another sacred site. Initiated by artist Juliet Fowler Smith – whose family has farmed the valley for generations – the Williams River Valley Artists’ Project brought together a group of environmentally-dismayed Australian contemporary artists. Their by turns elegiac, contemplative and strident responses were being fuelled by local residencies, research and exhibitions starting in 2009. 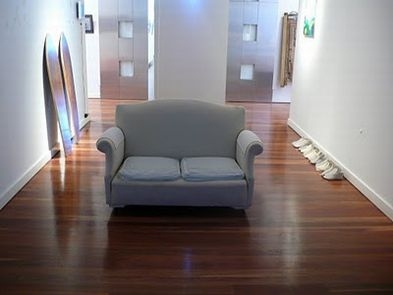 The first opened at the Muswellbrook Regional Arts Centre on 24 October, followed by cry me a river at the Tin Sheds Gallery in Sydney in September 2010 and another at Maitland Regional Art Gallery after that. about artist and participants Suzanne Bartos, Neil Bercery Brown, Ruby Davies, Bonita Ely, Joliet Fowler Smith, Noelene Lucas, Bridget Nicholson, Margaret Roberts, Toni Warburton, David Watson.